The Dodge County Master Gardener Association, in conjunction with UW Extension, offers help to all gardeners when problems arise or when they simply need a little encouragement. The Help Line will open on Tuesday, May 7, 2019. The hours are Tuesday mornings 9 am – 12 pm and Thursday afternoons 1 pm – 4 pm until September 5, 2019. However, if a gardener cannot make those hours, phone calls at 920-386-3790 or emails at askamastergardener@att.net will be answered in a timely manner. Master Gardeners have gone through extensive training in a broad range of topics ranging from soil, insects, vegetables, landscape plants, plant pathology, wildlife management and more. If they do know the answer to the question immediately, they have the resources to find it, or they will contact a University expert. They will ask questions until they get to the “root” of the problem and help solve it. After September 5th, the Help Line is closed, but questions will continue to be answered that come in by phone and email. 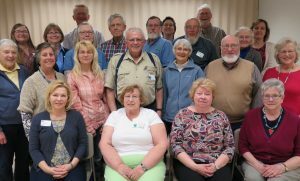 The Dodge County Master Gardener Association meetings for 2019 are held at the Administration Building in Juneau on the 4th Thursday of each month at 6:30 p.m. and are free and open to the public. Gardeners of all stages of expertise are invited! Come and bring a friend. Meetings in 2019 will cover the topics of Bee Keeping, an Off-Site Tour, Identifying Wisconsin Trees, Urban Wildlife, Heritage Seeds/Seed Saving, and more! See the 2019 Master Gardener Monthly Educational Program Schedule. 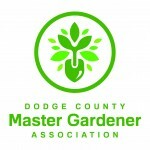 The Dodge County Master Gardener Association will have a booth at the 2019 fair. Theme will be announced soon, but as usual it will be exciting and educational! Master Gardeners will be on hand to help you with your gardening questions and provide information about the work we do in Dodge County. Come by on Wednesday, Thursday, and Friday from 1:00-5:00, Saturday 10:00-6:00 or Sunday 2:00-6:00 and see us at the Fair. Dodge County Master Gardener Association will host five dynamic speakers in a day-long event at the Horicon Marsh Educational Center on Saturday, November 2, 2019. Registration is required by October 18 and seating is limited. In the sixth annual Gardening for Gold Fall Symposium, local and regional speakers will be present to share their knowledge to gardeners of all levels of experience and skill. We are looking at small concepts that yield great expectations this year. Danielle Bell, owner of Native Roots LLC is going to teach about growing in small spaces with a large impact. Caryl Waterson, owner of BrynTeg Farm LLC, Ashippun/Oconomowoc, WI will teach about growing and using micro greens. Vijai Pandian, Horticultural Specialist for Milwaukee/Racine/Kenosha County will present how to grow small fruits in the backyard. Wrapping up the day will be an opportunity to have questions answered by horticulture experts Brian Hudelson and Lisa Johnson in a panel discussion. A tasty lunch will be included in the events of the day as well as a Silent Auction featuring many items of interests to gardeners and non-gardeners alike. Contact the Extension Office at 920-386-3790, a Master Gardener Volunteer, or email askamastergardener@att.net for more information. The Educational Display Garden at the Dodge County Administration Building in Juneau is looking good. Interested in what’s blooming? All plants are labeled with a plant marker and information about each plant can be found here. The Educational Display Garden at the Dodge County Highway Department is progressing nicely (it was planted in 2015). All plants are identified with a plant marker and more information on the individual plants can be found here. The Pollinator Educational Display Garden at the Bethesda Thrift Store was planted in 2016. All plants are identified with a plant marker and more information on the individual plants can be found at this LINK. The garden at the Highway Department was installed in 2014 and is specifically for an environment with full sun and excessive heat. The plants there are flourishing and blooming beautifully. Native varieties were used extensively, including Adam’s Needle Yucca, Prairie Dusk Penstemon, and more. The gardens (one on each side of the building) at the Administration Building were installed in 2013 and 2014. They include plants that do well in shade and sun conditions. The gardens have filled out spectacularly and are a feast for the eyes. Many native varieties also adorn these gardens, including Montana bachelor button, cupplant, winterberry, black lace elderberry, and lungwort. Recently, the Homeschool Youth Master Gardener Association worked at the gardens and learned about deadheading, weed identification, proper pruning, and mulching. Clients utilizing the Help Line often stop at the gardens at the recommendation of the Master Gardener Volunteers to view the plants as a possible addition to their landscapes. Anyone can access information about these plants and their characteristics by clicking the links above. 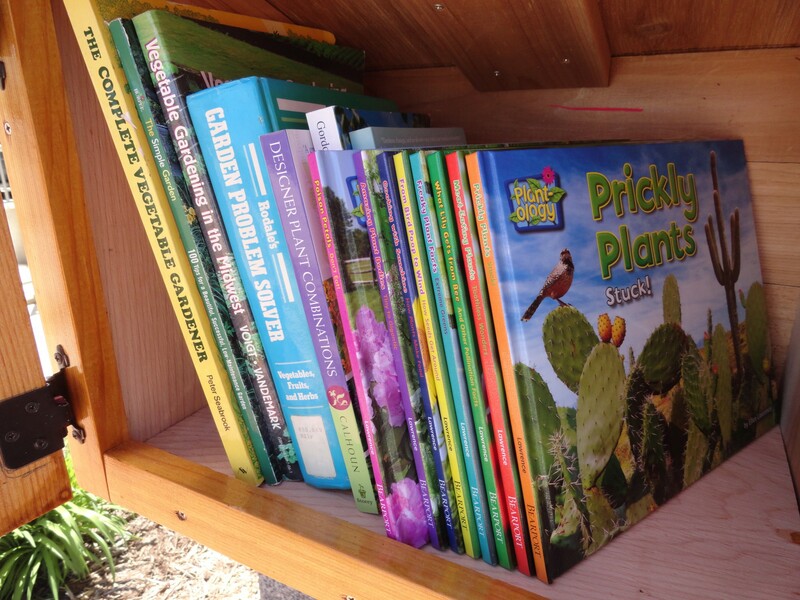 As an extra bonus, the garden at the Administration Building has a Little Free Library stocked with books and magazines for both children and adults on gardening. A bench conveniently located near the library allows visitors to sit and read while enjoying the beauty of the garden. The Bethesda Pollinator garden began in 2016 when Dodge County Master Gardener Association (DCMGA) was given the opportunity to take over an existing, but badly overgrown, garden in front of the Bethesda Thrift store in Horicon, Wisconsin. Bethesda Thrift Store has partnered with us and has supported our efforts to develop this space into a pollinator garden for educational purposes. The first year the primary task was recovering and establishing good pollinator plants in the garden. The Dodge County Bee Keepers Association donated funds in 2017 towards the purchase of plant stakes to help identify the plants. Those stakes are in place as well as a larger sign identifying the garden as a pollinator garden developed and maintained by DCMGA. Youth classes are held each year on site with training in identifying the plants, the benefits of pollinator gardens, how to maintain the garden, and how to develop one at home. In addition, a list of the plants with photos, their growing requirements, their benefits, and more. is available here so everyone will have easy access to the information. Questions can be directed to askamastergardener@att.net. The DCMGA supports a “Little Free Library” in the east garden. 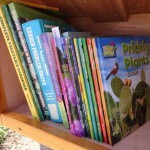 The library will be stocked with garden books for adults and children early spring through fall. It is near a bench where patrons can sit and read while enjoying the gardens. Please feel free to take a book, read it, and return it so we can keep the library going! For veteran gardeners or novices. If you are a veteran gardener or a novice, and would like to learn more about gardening and landscaping, consider participating in the next Master Gardener Volunteer Level 1 Training Program. Dodge County UW-Extension will offer a 14-week Level 1 Master Gardener Volunteer Training from 6:00 – 9:00 p.m. on Tuesday evenings beginning February 4, 2020 and concluding in early May. Training will be held at the Dodge County Administration Building, 127 East Oak Street in Juneau. Participants are required to attend a mandatory orientation meeting on Tuesday, January 21, 2020 at 6:00 p.m. at the Administration Building. This program is only offered in Dodge County every other year. The program cost is $150 and includes training, a comprehensive set of UW-Extension horticulture publications, and a one year membership to the local and state organization. The training is open to the general public and participants must be at least 18 years of age. Registration will be on a first come, first served basis and class size is limited to 25 participants. Registration deadline for the class is Friday, January 17, 2020. Acceptance into the class will be contingent upon passing a background check. For more information, call the Dodge County UW-Extension Office at 920-386-3790. This Dodge County program is not solely internet-based, but rather features a variety of hand’s on labs plus University of Wisconsin specialists and other guest speakers with expertise and knowledge on a wide range of different topics each week including: preparing soils for optimum plant growth, plant propagation, backyard wildlife, landscaping, insect identification & control, annuals & perennials, fruits & vegetables, native prairies, turf grass management, plant diseases, and weed control. Participants are expected to come to class prepared by reading the manual and watching the on-line lecture series. If participants do not have access to a computer, they can make arrangements to use one at the Extension Office. Successfully completing the training program is the first step to becoming a Certified Master Gardener Volunteer and a member of the Dodge County and Wisconsin Master Gardener Associations. Participants must also complete 24 hours of community service by October of the year after their training. In exchange for training, participants share their time and knowledge in approved education projects in their local area. Community service work can easily be accomplished through working on local community projects, providing educational assistance and training, or serving with other Master Gardeners at the local Help Line. Dodge County Certified Master Gardener Volunteers work at local public gardens, nursing homes, community beautification and education projects, home show exhibits, county fair displays and much more! For more information about the Dodge County Master Gardener Volunteer Level 1 Training Program please contact the Dodge County UW-Extension office at 920-386-3790. The Level 1 Training Registration Form has more information and a clip out section to mail in. 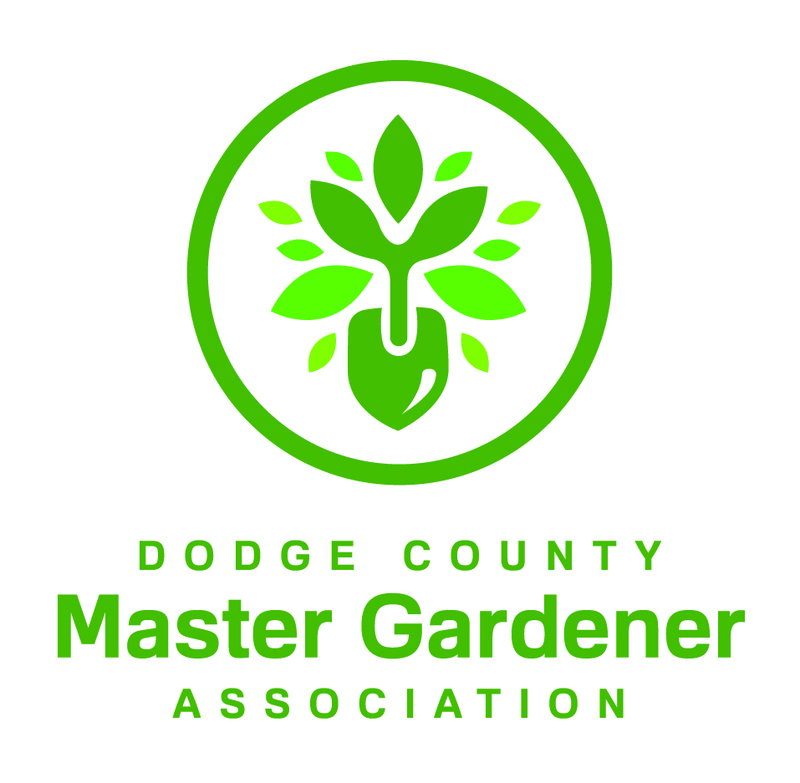 The Dodge County Master Gardener Association will award the fourth annual $1000.00 scholarship to a high school senior who is planning a career in some area of horticulture. The recipient must be a graduating senior from any public, parochial high school or home school in Dodge County. The student must have applied to a two or four year accredited college or technical school that has a program leading to a degree or certification in the horticultural area. Careers may include, but are not limited to, teaching, plant pathology, agronomy, agricultural engineer, landscape contractor, or landscape architect. As part of the scholarship application, the student will be required to write a statement of 300 or fewer words that his/her chosen career will meet the requirement of horticultural or related studies. Additionally, the student will need to provide two letters of recommendation. The specifics are detailed on the application form. The completed 5-page scholarship form must be submitted or postmarked no later than March 20, 2019 to the scholarship committee chairperson whose address is on the application form. Application forms are available in the guidance offices of Dodge County area high schools. They include Beaver Dam High School, Dodgeland High School, Horicon High School, Hustisford High School, Lomira High School, Mayville High School, Randolph High School, Watertown High School, Waupun High School, and Central Wisconsin Christian School. An outreach arm of Dodge County UW-Extension (UWEX). MG’s are trained volunteers who aid UWEX by helping people in the community better understand horticulture and their environment. The goal of the program is to train enthusiastic volunteers so they can, in turn, provide research-based information on a wide variety of horticultural topics to the general public in their communities. Complete a 36-hour horticultural educational training offered by UW-Extension. As a Certified Master Gardener Volunteer. Become a “Friend of the Master Gardeners” for only $7/year. Fourth Thursday of the month from January through October. Meetings begin at 6:30 pm and are typically held in the Auditorium Room of the Administration Building located at 127 E. Oak Street in Juneau. We do, on occasion, have a change of night or venue. The meetings are open to the public and free of charge. The Dodge County Master Gardeners provide approximately 2800 hours of education, community service and outreach annually. Their volunteer efforts directly and indirectly touch the lives of all Dodge County citizens as they work at nursing homes, historical societies, schools, parks, and youth programs. Late 1970’s – The MG program began in Wisconsin through UW-Extension. 1992 – Local MG groups formed the Wisconsin Master Gardener Association (WIMGA). 2004 – Local MGV’s organized the Dodge County Master Gardeners Association. Contact Dodge County UWEX at 920-386-3793. Deb Steinich-Secretary; Connie Alderden-Vice President; Diane Hemling-President; Chris Jacobs-Treasurer; Gae Bergmann-Local Record Keeper. Front Row: Kim Fay, Marianne Zastrow, Judy Hagman, Joan Loomis. Second Row:Gae Bergmann, Loretta Ortiz-Ribbing, Tina Hopp, Glen Greenfield, Kay Voelker, Dennis Loomis, Jan Krause. Fourth Row: Berwyn Westra, Carol Shirk, Terry Zimmerlee, Becky Goodrich.